It’s a great place to chill – just be careful of the pointy salt bed below. Since young, swimming in the Dead Sea had always been my dream. As touted in books and shows, the unsinkable feeling was just out of this world. I loved swimming as a kid, and I couldn’t believe that it was possible not to sink in water! I recalled asking my parents repeatedly if this was true, but I supposed, as my parents had not been to the Dead Sea, it was hard to answer me. 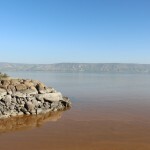 Finally, in my late twenties, I had an answer to my question – it is very possible to sink in the Dead Sea. In fact, the buoyancy actually makes it a tad harder to swim. And it’s not all that a comfortable experience, given that the sea bed is really rough with salt deposits at the bottom. In addition, you’ve got to be really careful and ensure that you place your feet firmly on the surface, or you may cut your toes. But that said, it’s pretty easy to float on your back (just make sure water doesn’t get on your face.) Simply lie back, and enjoy the cool waters and the bright blue sky. 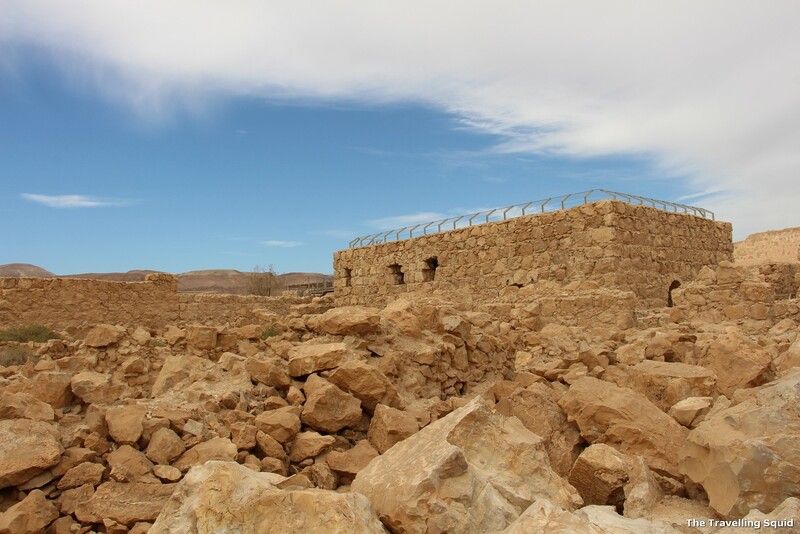 The Dead Sea seems easily accessible from here, but you can only visit designated areas. 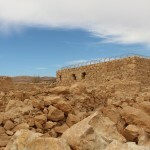 When we first travelled through Masada, I thought driving to the Dead Sea was a straight forward affair. All you had to do was to stop by the bank of the ‘sea’ and walk right into it to take a dip. Our guide later shared that there were areas which were closed to public, as there were mud and sinkholes. That could actually be dangerous. The designated areas for swimming actually come with shower facilities too – which is a welcome addition after a dip in some extremely minerally and salty water. 2. Don’t let the water come close to your eyes, mouth, nose and face. Bring a pair of goggles if possible. 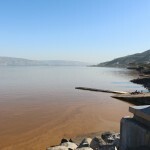 The water is full of minerals and high salt content, and could cause you much discomfort should it come into contact with your face, your eyes and mouth. The only antidote is to rinse those parts with cold water. Therefore, a pair of goggles might be helpful in this case! 3. The water tastes disgusting. Try at your own risk but spit it out immediately. Since I had come all the way, I decided to have a taste of the water. (Note: Please do not ever think of drinking it.) The salt content was so high and there was a sulphur-like taste to it. It’s fine to taste it, but spit it out immediately! Please make sure you have a bottle of fresh water with you, for rinsing purposes. And this brings me to my next point. 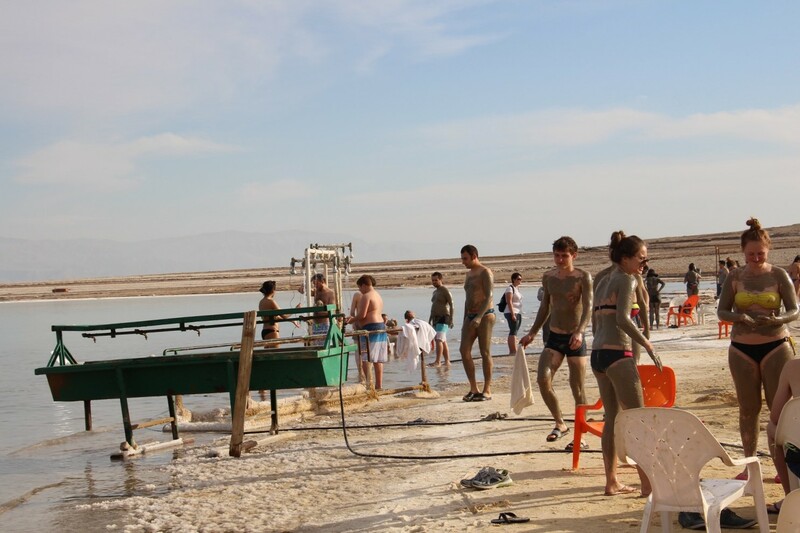 Fresh water taps are available at the Dead Sea – they are super cold though! 4. There are showers for rinsing, but bring a bottle of freshwater with you. There are fresh water showers at the Dead Sea (a very consideration addition), but it’s good if you have a bottle of freshwater with you for drinking, or just rinsing your face or eyes in the event they come into contact with the sea water. Be careful of the sharp pointy salt-bed. 5. Bring a pair of good quality slippers with you. This is to navigate against the salt deposits on the rocky floor. It’s very important! In fact, a pair of Crocs would be great, to help you get a good grip. My pair of Havaianas lasted me well, as I held on to it tightly with my big and second toe. Avoid low quality slippers as you may lose it, given how difficult it is to grip them. 6. The changing rooms have no doors. So put aside Asian modesty, and brave the shower. I first entered the changing room, and was slightly taken aback. There were no doors, and people were just showering in enclosed cubicles. But I put aside my Asian modesty and showered – it was an okay and no one paid me any attention, so it was fine I guess. There was no space to hang one’s dry clothes, so you’ve got to shower, and then come out to change into clean clothes. 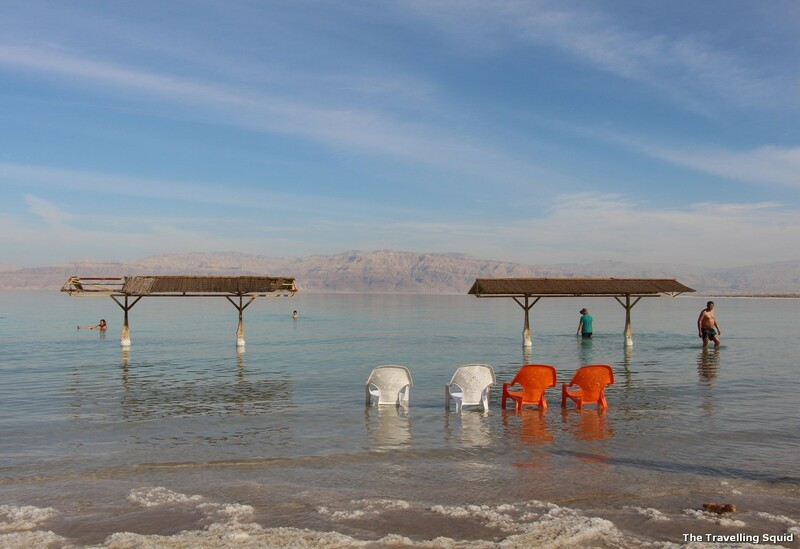 Being in the Dead Sea is a once-in-a-lifetime experience. I wish we could have stayed there a little bit longer, but Friend S cut his toes pretty badly and they were bleeding :/ It’s even more painful in super salty water, so beware! 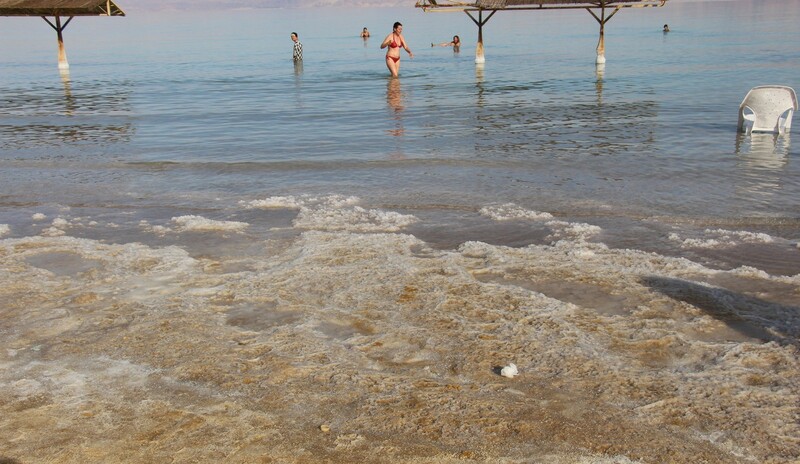 Like the Inca Trail and Pompeii, I’ve always dreamt about visiting the Dead Sea. It was the dreams of my childhood years, in which the children’s encyclopedia would detail in graphics what it was like to be in the Dead Sea (you’ll never sink). The truth is, you’ll sink quite easily if you lose your balance. 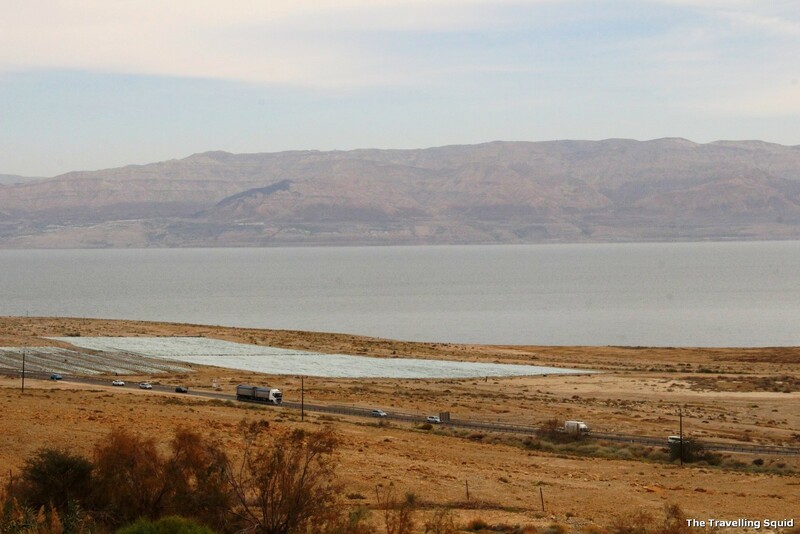 And at 9 years of age, I never expected that Phebe, close to two decades later, would find herself immersed in the Dead Sea, worrying that she would cut her toes on the sharp sand bed right below. It’s a dream come true. 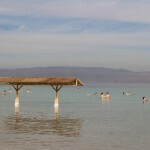 One Response to "Six things to take note of while swimming in the Dead Sea"